When STL is selected from the File>Import submenu, the Open dialog appears, through which you are able to specify an STL (*.STL) file to import. Click on the OPTIONS button to change the available import settings. STL files contained geometry comprised of polyline triangles. Using the Polyline Display Options you can choose how the polylines will be handled upon import. Once the settings available from the Read STL Polygon File dialog have been configured, select OK. The file is then read in. Unfilled Polylines – Polylines are converted to unfilled polylines. Temporary Polylines – Polylines are displayed temporarily (not added to the database). Filled Polylines - Polylines are converted to filled polylines. 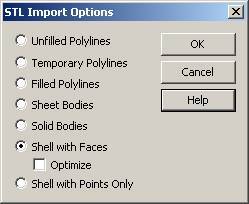 Sheet Bodies - Polylines are converted to sheet bodies. Solid Bodies - Polylines are converted to solid bodies. Shell with faces - Polylines are converted to a shell entity composed of polygon faces. Selecting the Optimize check box results in a smoother looking shell. Note that this optimization may not work correctly with certain types of geometry conditions. Shell with Points Only - Polylines are displayed using a shell entity composed of the polylines’ vertices.